Of Green Peas and B-fields: how do galaxies get their magnetic field? Today, most observational astronomy is done by large teams. But there are large teams, and then there are large teams — the paper I’m discussing today builds on the work of 250,000 members of the public who participated in the Galaxy Zoo galaxy classification project. The paper discusses a new class of young, emission line galaxies — “Green Peas” (they are called emission line galaxies because they have a strong emission line over and above the continuum emission, and “green peas” because they are small and greenish). The paper presents them as a tool for studying star formation in the nearby universe and then details their magnetic fields, which are far higher than what would be expected for such young galaxies. These galaxies, which are small ( 5 kpc), young (star formation began at ) and light ( ), are analogous to the higher-redshift Lyman Break Galaxies (LBG’s), which are star-forming galaxies selected based on a break in the spectrum at the Lyman limit (the wavelength of a photon required to ionize hydrogen in its ground state). However, since these galaxies are much closer (for small redshift , remember distance , the speed of light and the Hubble constant), they can be imaged directly, which, serendipitously, happened for some of the Grean Peas with Hubble Space Telescope. For Lyman Break Galaxies, the usual technique is to stack the radio emission data, but because the Green Peas are closer, Chakraborti et al. were also able to follow up with deep observations of 3 galaxies with the Giant Metrewave Radio Telescope (GMRT). Compared to the Milky Way, these galaxies really do look like green peas -- small and green! Image courtesy of Carolin Cardamone and Sloan Digital Sky Survey. What can we learn from these galaxies? The Green Peas have very high star formation rates, leading to numerous supernovae. These in turn accelerate electrons, which produce synchrotron emission in the radio. Because the electrons have short lifetimes, this emission traces recent star formation. This type of emission is also expected in LBG’s, as they are also star-forming, but to date there has been no direct detection. Using the standard (from LBG’s) stacking technique, Chakraborty et al. find the average radio flux of a Green Pea is suppressed relative to usual starburst galaxies by a factor of 2. This result is in line with those from LBG’s, which also have a lower radio flux than local starbursts. However, because Green Peas are so much closer, Chakraborti et al. were able to follow up with direct radio observations of 3 of the most promising peas. Using both these results and those from stacking, they consider several explanations for the suppressed radio flux observed. For LBG’s, one suggested explanation has been that the electrons that would produce the radio emission cool via inverse Compton scattering off of the Cosmic Microwave Background (CMB) photons. But, the CMB radiation density is far too low to be a plausible cause at z=0.2 (this explanation might work for LBGs at z=2-5, but recall that radiation density falls with scale factor . . .). Another explanation is that the electrons inverse Compton scatter off of radiation energy produced by the young stars in the galaxy itself. Chakraborty et al. conclude that this is a viable explanation for the flux suppression. But the suppressed flux has larger ramifications: it can be used to constrain the magnetic field in the galaxy. And since Green Peas are very young galaxies, constraints on the magnetic field can suggest which formation mechanisms for galactic magnetic fields are viable. Here’s how it works: to explain the radio emission, the magnetic field must be large enough so that the electrons lose enough energy to produce the radio emission before they diffuse out of the galaxy. Using this to place a lower bound on the magnetic field, the authors find a magnetic field (micro Gauss). This argument is basically a back-of-the envelope type calculation, so the authors cross-check it with one based on different considerations: equipartition of energy between the B-field and whatever relativistic particles are present. Remarkably, using this argument, the authors find . So they conclude that the Green Peas are likely to have a characteristic magnetic field of , much larger than the average field in the Milky Way, which is . This is important because the magnetic fields of galaxies are ‘thought to be the result of amplification of tiny seed fields by dynamo action over the galaxy’s lifetime.’ However, this mechanism would be far too slow to explain the observed B-field because the Green Peas are so young. 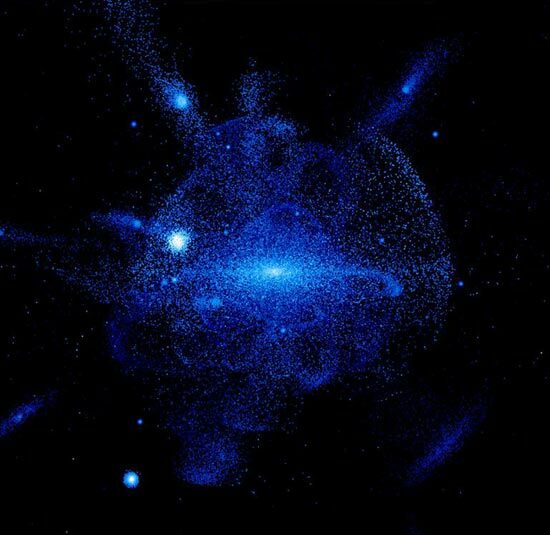 Another mechanism the authors consider is that the fields are generated by magnetized plasma jets from a central compact object — but they also consider this unlikely. They conclude that their results favor an explanation proposed by Kulsrud and Zweibel (2008): turbulence created by the formation of substructure created the magnetic fields. Because the Green Peas are so similar to LBG’s, the authors conclude by suggesting that it is likely that these galaxies when young also had similar magnetic fields — which means fields much stronger than those previously accounted for in theoretical and computational studies of the epoch of reionization, around , when matter in the universe was reionized by the first stars. So while humbly named, the Green Pea galaxies may prove a useful guide in understanding not only star formation (because they are so close and so active) but also for broader-scale cosmological simulations of the high-redshift universe. Thank you for this summary of the Chakraborti et al. paper. I was finding it very heavy going, but your explanation of some of the terms and ideas has helped a lot. I’m still not up-to-speed on galactic electromagnetism though: I doubt I ever will be . . .